For years we’ve taken pride in providing THE Chile experience to our guests. From the energetic city of Santiago to the awe-inspiring Patagonia region, we offer the most comprehensive experiences in Chile. We are relentless in our goal to make your journey with us the most memorable you will ever have. We do this by not only providing unequaled service and hospitality but by giving you the opportunity to fly fish in our world acclaimed rivers, lakes and lagoons and offering a wide variety of adventures for all levels. 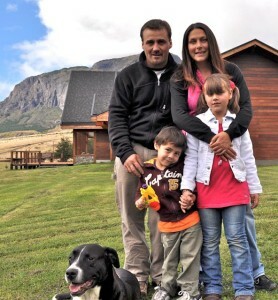 Coyhaique River Lodge is locally owned and operated by the Urrejola family. The Urrejola family have been living in the Coyhaique area for many years and has been developing their fly fishing and eco adventure company Rumbo Patagon Outfitters, since 2000. As locals, they have the experience known only to those that have lived and worked in this area for many years. A native Chilean, Gaston is a lover of fishing and the outdoors. Gaston spent most of his summers fishing and exploring in Chile. He spent two years in the U.S. where he mastered the English language and learned about the U.S. culture. Living in Patagonia, learning about its secrets and mastering its river systems gave him the experience to start Rumbo Patagon along with his brother and other family members. Today, Coyhaique River Lodge is providing the best fly-fishing and adventure experiences in Chilean Patagonia. Claudio is a wild life Veterinarian specializing in fish and aquatic systems. An avid fly fisherman, he is a lover of the outdoors and has spent years trekking and fishing in Patagonia. Claudio lived in the U.S. for one and a half years where he learned English, traveled, and fished the rivers of Washington, Oregon and Idaho. His vast knowledge of the land and river systems in Patagonia along with his easy-going personality and strong, quiet leadership, make him a great manager and guide. The two brothers are now raising their families in this region they love so much. Getting to know Gaston’s wife Viviana and their two children Renata and Max are very much a part of the family experience every guest grows to love so much. Claudio’s wife Francisca is very much involved in the wool fabrication of blankets going into each guest’s room along with the full time job of being mother to their beautiful young daughter Martina. It is not unusual for guests spending just one week with the Urrejola family to return to home with a feeling they have found their new home away from home.